The 1948 film, Joan of Arc, follows the life of the Catholic saint Joan of Arc, dramatizing her hagiography from age sixteen to her death at age nineteen. Directed by Victor Fleming, the film is, quintessentially, a Hollywood film of its genre. 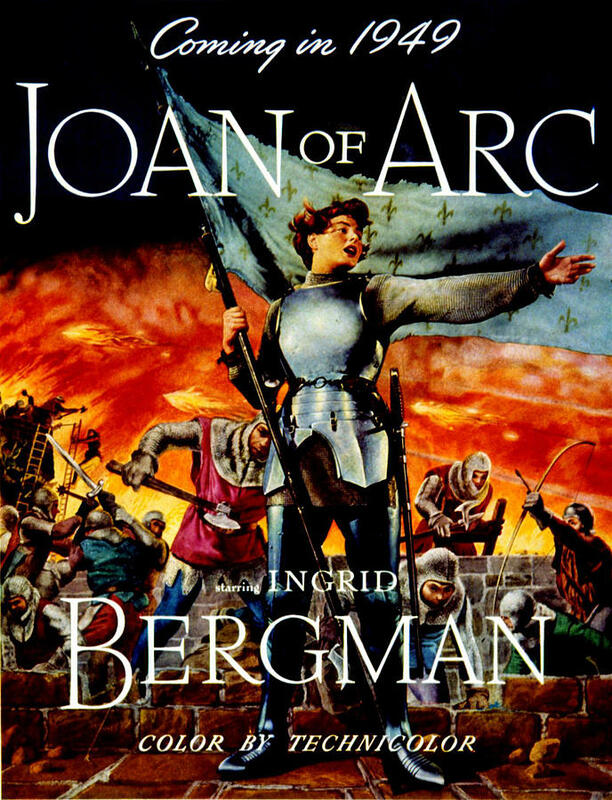 The film adapts the play Joan of Lorraine by Maxwell Anderson, although the meta-narrative, “play-within-a-play” structure was abandoned in favor of a more conventional story about Joan. 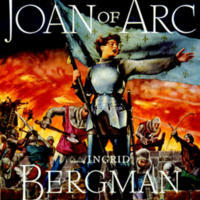 Ingrid Bergman, who was the star of Joan of Lorraine onstage, reprised her role for the film. The film also stars José Ferrer as King Charles VII and Francis L. Sullivan as Pierre Cauchon. With a budget of $4.6 million, the film was not successful at the box office in the United States, as it only made about $4.1 million in ticket sales. Regardless, the film garnered six Oscar nominations, and two wins for best cinematography and costume design. Although nominated for best actress in the role, Bergman’s performance received mixed reviews from critics. With Renée Falconetti’s performance as Joan in Passion of Joan of Arc (1928) considered one of the best acting performances of all time, Bergman following up in the role of Joan of Arc, albeit in a very different kind of movie, was no small challenge. Joan of Arc (1948) and Passion of Joan of Arc (1928), however, do share some commonalities, such as the way both films shot their subjects during Joan’s infamous trial, though of course they are artistically and tonally different. The 1928 film follows an experimental pattern, as nearly the entire film remains spatially ambiguous. Its experimental approach allows Passion of Joan of Arcto focus more on Joan’s raw emotion through close ups and tilted angles, through her trial and eventual execution. In contrast, the 1948 film, which is in color, follows a more “realistic” approach, where most shots appear more true to life, like a full-scale painting come to life. Because of this approach and its narrative scope, Joan of Arc is a more biographical film. While both films find their roots in similar primary sources about Joan’s life, the films begin years apart. Joan of Arc begins in Lorraine, France, at Joan’s home in 1428; whereas, Passion of Joan of Arc begins at Joan’s trial in Rouen, France, three years later. Despite these differences, the films both convey similar “truths” about what we know of Joan’s life. In both films, for example, Joan wears male clothing and receives push back from ecclesiastical authorities, who threaten her and at the trial question her non-conformity to gendered norms. Both films also depict men in positions of authority mocking Joan. During the trial scene in each film, the judges laugh at Joan and refuse to take her seriously because of her gender and social background. Both films also ultimately highlight Joan loyalty to her cause and divine mission. Because Joan of Arc (1948) is a biopic, it does strive to be historically accurate in many ways, and sometimes it achieved accuracy unintentionally. John Aberth, author of A Knight at the Movies, had pointed to Joan’s accent, which is Swedish (Bergman was Swedish), in the film: “Since she [Joan] came from Lorraine, on France’s eastern border with Germany, Joan more than likely spoke with a German accent” (291). Because German and Swedish accents sound similar, Bergman’s accent in the film may have captured the way Joan sounded to her French contemporaries. Furthermore, because Bergman aimed for medieval authenticity for the film she helped finance, the filmmakers had Bergman’s armor made by the Metropolitan Museum of Art’s armor department. Although constructed with aluminum rather than steel, the costume appeared authentic to the period in which the film took place. Like the real life Joan, the dramatic arc of the 1948 film version of Joan is her ability to break down traditional gender roles and social barriers to lead the French armies to victory, guided by her voices from Saints Margaret, Catherine, and Michael. In the film, it is made clear that Joan wears men’s clothing for practicality’s sake— to become and be respected as a military leader—but also because she is commanded to by her Voices, and for self-protection from sexual violence. Joan is also cast as a traditionally “masculine” hero, whose traits in the Siege of Orleans allow her to lead numerous men, who follow her willingly and with respect to battle. As a traditional biopic, Joan of Arc captures the spirit of the courageous maid from Lorraine with the utmost dignity and respect. Rachel Julian, “Joan of Arc (1948),” Medieval Hollywood, accessed April 24, 2019, http://medievalhollywood.ace.fordham.edu/items/show/129.